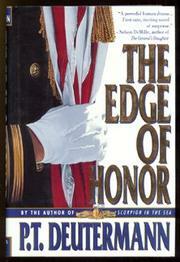  Deutermann (Scorpion in the Sea, not reviewed) stows the Age of Aquarius aboard a naval frigate in The Edge of Honor. In an effort to advance his naval career, Lieutenant Brian Holcomb leaves his beautiful wife behind to participate in a seven- month-long deployment aboard the USS John Bell Hood stationed in the Gulf of Tonkin in 1969. Communist MiGs and Pacific typhoons threaten the ship, but the true menaces are its own marijuana- smoking sailors who are tolerated, Holcomb learns, because reporting them could not only damage the ship's reputation but deplete most of its personnel. Due to the unpopularity of the Vietnam War in America, the Navy does not have the manpower to provide replacements for such ``unplanned losses.'' When it becomes tragically clear to Holcomb during shore-bombardment operations against the North Vietnamese army that the Hood's defense system has been placed in peril by pandemic drug use, he is galvanized to take action and risk his forthcoming promotion. Receiving little support from a seldom-seen captain in dubious health or from the evasive second-in-command executive officer, Holcomb searches for the drug supplier--aided by chief boatswain Louis Jesus Mar°a Martinez and African-American master-at-arms Chief Wesley Jackson, whose multicultural presences provide more than tokenism in the story. The tale of Holcomb's stateside wife, Maddy, is a tender account of a military marriage and a respite for the civilian reader weary of the obscure acronyms that hamper the book's early moments of suspense. However, upon reaching the climax, readers are so riveted (or, by this time, so well-versed in military jargon) that they are able to follow the rapid action through the ship's narrow corridors and down its steep ladders without stumbling. Social change is as threatening as Communism in this detailed and, finally, compelling adventure.